Just like Cain and Abel, along with Ishmael and Isaac, Joseph and his brothers have problems, too. There are two reasons why Joseph’s brothers don’t like him. First, he’s Dad’s favorite. Second, he doesn’t know when to keep his mouth shut. As a result, Joseph’s brothers sell him off as a slave, and he gets hauled off to Egypt. Yet, God orchestrates their reunion: Joseph has risen to a position of power in Egypt. He has stockpiled food for the future. Meanwhile, his family back home is starving. His brothers go to Egypt to buy food, and eventually Joseph reveals himself to them. He invites them to Egypt, where they have plenty to eat and a great place to live. 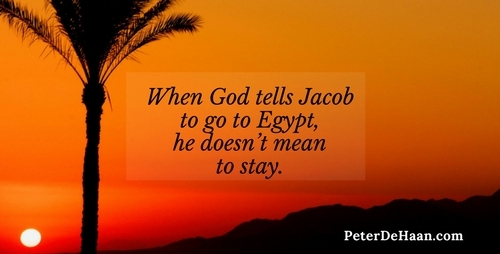 As Jacob wrestles over what to do, to go or to stay, God tells him not to be afraid and to go to Egypt. God also promises to bring Jacob back home. Jacob gathers his family and they had out. When they arrive in Egypt, the family is reunited. Jacob again sees Joseph, his beloved son who he thought was dead. Jacob directs his family to the land of Goshen, a great place for them to live and raise their flocks. They go there and settle down. Life is good. They stay four-hundred years. I don’t think this is what God had in mind when he sent them to Egypt. I think this was a short-term command, to go to Egypt for as long as the famine lasted and then return home. Why else would he have promised Jacob he would bring him home again? Instead, Jacob and his descendants stay. They don’t return home. Their numbers grow, and they’re eventually enslaved. Life’s not so good for them anymore. Sometimes when God tells us to do something, like go to Egypt, it’s a short-term command, not a permanent instruction. Thankfully, even if we misunderstand what God tells us to do, he can still turn our situation around and make events work out for our own good.